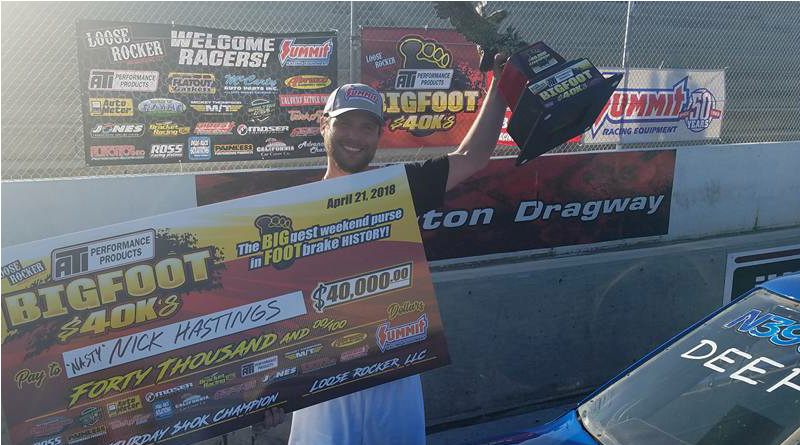 Darlington – The 2nd Annual ATI Performance Products Bigfoot $40K comes to Darlington Dragway April 26-28. After a super successful St. Patrick’s Classic in March, the Loose Rocker team is gearing up for another huge turnout for the Bigfoot $40K. Last year the Bigfoot $40K saw 242 racers compete for huge payouts. Toby Barnes, “Nasty” Nick Hastings, and Randy Weller all found huge paydays at the inaugural event. The ATI Bigfoot $40K is a footbrake only event and is reserved for doorcars and left-hand steer roadsters only. This year racing action starts on Thursday with a Test-and-Tune from 4-9PM. The event also features a Legendary 64 Shootout starting at 6PM Thursday. The Shootout pays $5K to win for a $200 entry. Entries are accepted on a first-come, first-serve basis. Friday kicks off a huge weekend of big money bracket racing which includes a $10K race on Friday, $40K on Saturday, and another $10K on Sunday. Racers can enter daily or save $125 if they purchase a weekend entry for $475. In addition to the big money races throughout the weekend, the Bigfoot $40K schedule includes $3K to win Gamblers races on Friday and Saturday night. As always, the folks from Motormania TV will be streaming the event live. The Saturday night Racer Appreciation Party will provide dinner for all of the contestants. On Sunday morning, God Speed Ministries will provide non-denominational services for those in attendance. Racers who purchase a weekend entry can also qualify to win a free race trailer. All weekend entries will go into a year-end drawing for a chance to win a decked-out 28′ Vintage Outlaw enclosed trailer, Loose Rocker gold cards, and more. For more info contact Anthony Walton (910-382-6723) or Michael Beard (440-415-3541) or see the event flyer posted below. Find more Loose Rocker race results here, here, and here.